After our first swimming gala against Royal Alexandra School, which Meath Green narrowly won by 2 points, we took it up a level. Two teams went to Guildford to compete against the best of Surrey. Here follows a little article written by 1 of our swimmers. To both, swimmers who competed against Royal Alexandra and the swimmers competing on Saturday, well done! you did really well and should be very proud of your achievements!!! On the evening of Saturday 31st January 2015, 8 swimmers had the opportunity from Meath Green to participate in The Surrey Schools Swimming Association Primary Team Championship. We arrived with high hopes to do well in this gala. 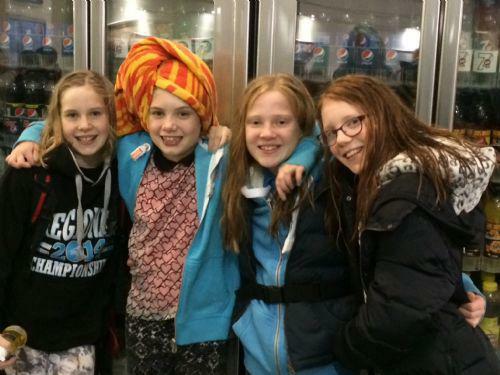 This swimming gala was held at the Spectrum in Guildford. This gala was against some other schools in Surrey. We were the only local team. Most schools had two teams, a girls team and a boys team. With 4 in each team. First of all the girls large schools started their warm up at 6:30pm. The girls were all in the same lane with about 3 other schools as well as themselves. After the girls warmed up the boys started their warm up with all in the same lane again. The warm up lasted till about 7pm. After we all did our warm the girls got called to do their 100m Medley Relay. The order this went in was 25m backstroke - Lily, 25m breaststroke - Maisy, 25m butterfly - Amie and 25m freestyle (front-crawl)- Ellie. The girls did extremely well with this and in the end they came 9th which was ever so close to get into the final. If they came 1st - 8th they would have qualified but we still did extremely well. The girls did the Medley Relay in 1minute and 24 seconds! The girls were so proud of themselves! After all of the girls did their Medley, it was the boys turn and they did amazing too. The boys did their Medley in 1 minute 39 seconds! Which is incredible too. After all of the schools, boys and girls did their Medley it was the girls turn to do their 100m Freestyle Relay, the girls were motivated to do well with this as it was the last event of the night. The girls finished with an amazing time of 1 minute 15 seconds, incredible we were so proud! Not long after the girls the boys started their freestyle relay the boys did so well too, like the girls! The girls succeeded 9th again!! We were so close again but we were ever so proud! After we had some feed back from Mrs Whitmore and Mrs Flanagan we went and got a shower and got changed really quickly and we had some Belgian biscuits, yummy! That was the end of a successful night, we left Guildford with a grin on our faces! Good luck to anyone who is going to participate next year!